BULAQ is a podcast about contemporary writing from and about the Middle East and North Africa. It looks at the Arab region through the lens of literature and at literature through the lens of current events. BULAQ is co-hosted by Ursula Lindsey and M Lynx Qualey and produced by Issandr El Amrani. View of Bulaq quarter, Cairo. HAY, Robert, Esq. 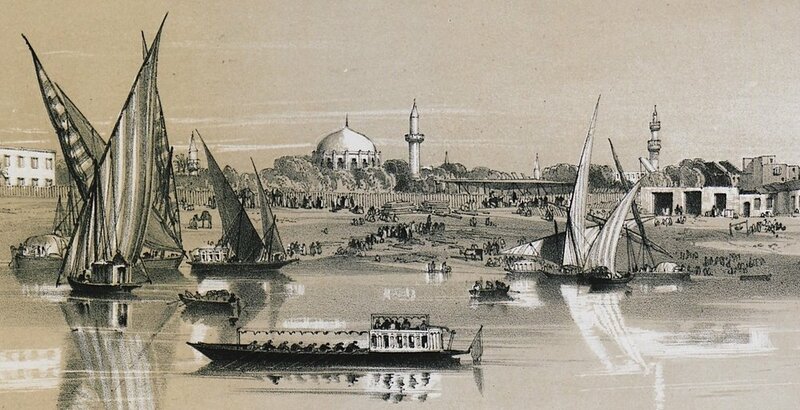 Illustrations of Cairo, London, Tilt and Bogue, 1840. BULAQ is a podcast about contemporary writing from and about the Middle East and North Africa. It looks at the Arab region through the lens of literature and at literature through the lens of current events. BULAQ is co-hosted by Ursula Lindsey and M Lynx Qualey and produced by Issandr El Amrani. BULAQ is named after a neighborhood of Cairo that hosted the first active printing press in the region. Established in 1820, the Bulaq Press put out its first publication, an Italian-Arabic dictionary, in 1822. MLQ is a book critic, editor, ghostwriter, and literary consultant with a focus on Arab and Arabic literatures, particularly as they intersect with translation. She runs the blog ArabLit. Ursula is a journalist and book critic who writes about education, literature, and politics in the Arab world. She contributes to The Nation, the New York Times, The Point and The Arabist blog. Both Ursula and MLQ spent many years living in Cairo and are now based in Rabat, Morocco. You can subscribe to this podcast using this RSS feed or on iTunes. The Return by Hicham Matar explores secret prisons in Libya under Ghaddafi, in search of a trace of the author’s kidnapped father. Pearls on a Branch, by Najlaa Khoury, tr. Inea Bushnaq is forthcoming from Archipelago books March 2018. This ridiculously delightful folktale collection is based around work Khoury collected in Lebanon during the civil war, many of which became stage productions. A collection of them was published in Arabic in 2014, and soon they’ll be available in Bushnaq’s fun, luminous, inventive translation. Moroccan Folktales, ed. Jilali El Koudia, translated by Jilali El Koudia and Roger Allen with a critical analysis by Hasan M. El-Shamy, is newly available as a paperback from Syracuse University Press this February 2018. The Cairo Book Fair runs this year through February 10, 2018. “The Rise and Fall of Egyptian Arabic” can be found on The Economist. Egyptian President Abdel-Fattah El Sisi’s ominous recent speech. Sisi is running for a second term against just one other candidate, who turns out to be a great fan of his. "He had electoral tendencies and wanted to nominate himself.